Ok, so it’s a black box, sort of shiny, with a switch on top. But what does the switch do? Does it launch a nuclear attack? Does it terminate someone you don’t know somewhere in the world? Does it make bacon magically appear? You stare at it over and over, hour after hour, until you can’t take it anymore. You turn it on. And out of the box, a little finger pops out and turns the unit back off. That’s all it does, and the smile on your face is proof it works. 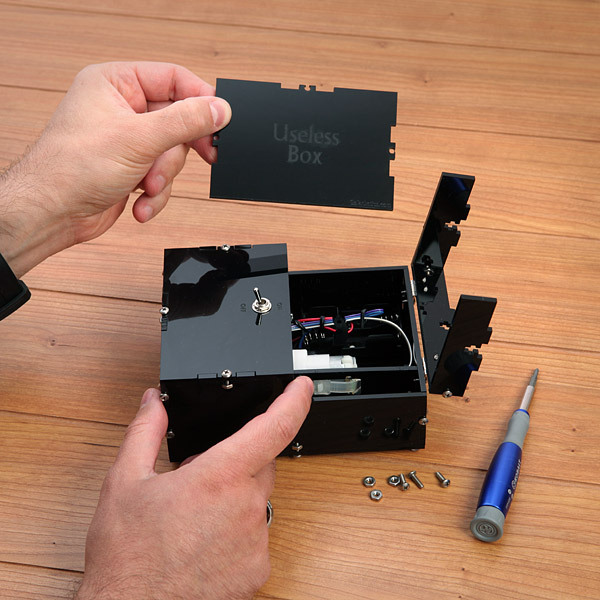 Presenting, the Useless Box Kit.